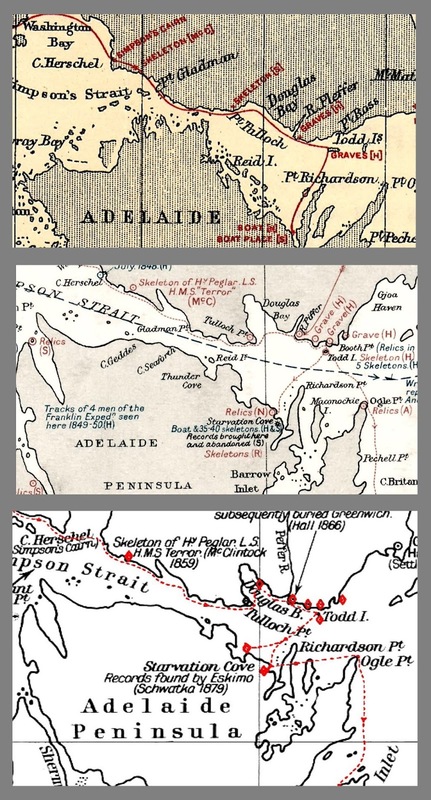 These three maps, by Markham 1880, Gould 1926, and Gibson 1937, show minor variations in the supposed line of retreat of Franklin's men along the Southern coast of King William Island then making a long crossing to the Adelaide Peninsula at the Todd Islands. While none is impossible, the question should be asked is why didn't they cross near Tulloch Point, where Simpson Strait is at its narrowest, before heading East along the North coast of the peninsula? 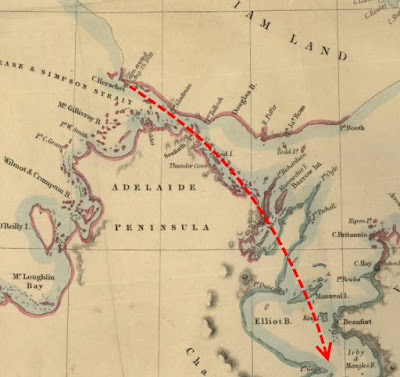 In any event the maps showing the route touching the tip of Ogle Point are to be questioned as the only relics discovered there were "a small piece of cod-line, and a strip of striped cotton, about two inches long and an inch broad" which were found in an Inuit cache. There is no reason to suppose they were deposited anywhere in that vicinity by the retreating crews. Twentieth century finds of relics and human remains on the Adelaide Peninsula, plus Inuit testimony may suggest an alternative route. "Mr. Learmonth and Mr. D. G. Sturrock discovered the remains of three men at Tikeraniyou (1) together with a George IV Half Crown and a large ivory sailor's button (Pootogo). The remains were taken to Goia Haven and the relics forwarded to Hudson's Bay House, Winnipeg. The place is a point of land shaped like a crooked finger, and is where the land bends round to the southwest, between 12 and 15 miles west of Starvation Cove." "Along the rest of the north coast of Adelaide Peninsula are the following named islands ... tikEranajuk (the little forefinger-like)..."
In 1926 Trader Peter Norburg reportedly found a skull with an oak sledge runner and fragments of Navy cloth and shoe leather at Thunder Cove. 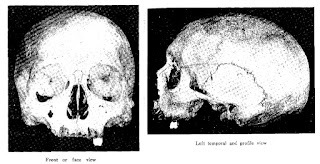 The skull was examined by archaeologist Henri-Marc Ami who wrote "I can come to no other conclusion but that is the skull of a man of modern European type, and presumably that of an Englishman." Neniook, Eyaritituk's mother, about seventy years old, reported having come across the skeletons of seven white men still partly clothed in blue serge, and partly buried in the sand and seaweed on a small island in the vicinity of (2). Based on these discoveries, David Woodman, in "Unravelling the Franklin Mystery, Inuit Testimony" has questioned what he refers to as the "standard reconstruction" of the retreat. 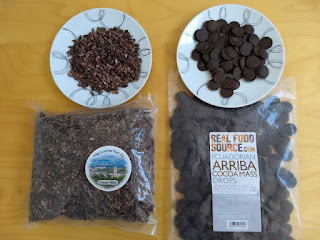 Connecting these finds together produces a credible alternative route. 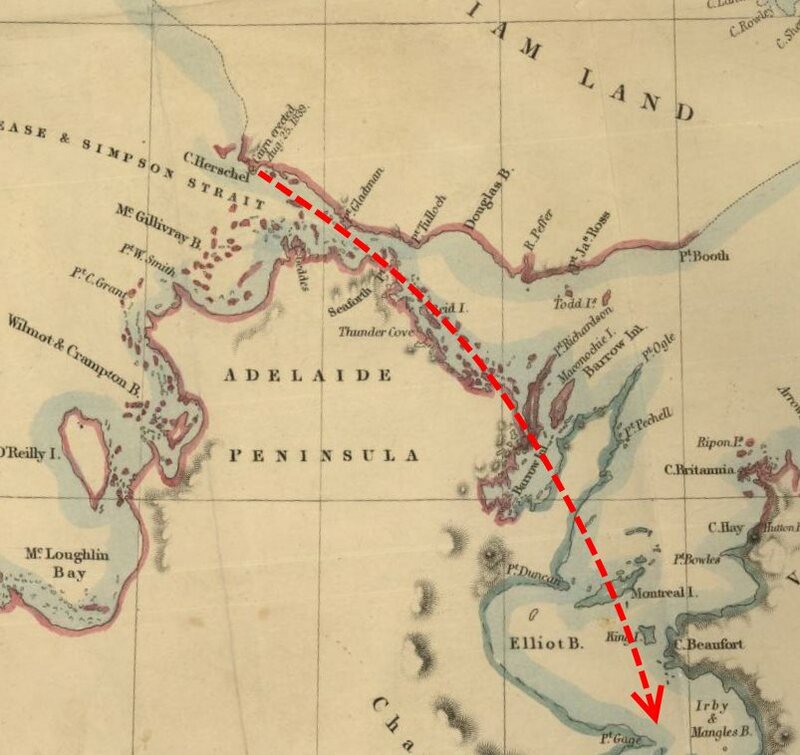 It seems reasonable that when Captain Crozier and the surviving officers of the Franklin expedition were planning their march to the mouth of Back's Fish River that they would have chosen the shortest route. The relics and remains suggest that at least some of the men, possibly the majority, took this path. That some of the party took a different track may be because they became lost in conditions of poor visibility or that they deliberately divided into groups to maximise the chance of finding sufficient game to sustain them by hunting. Using the 1839 cartography available to Franklin the best route to the Fish River seems obvious. 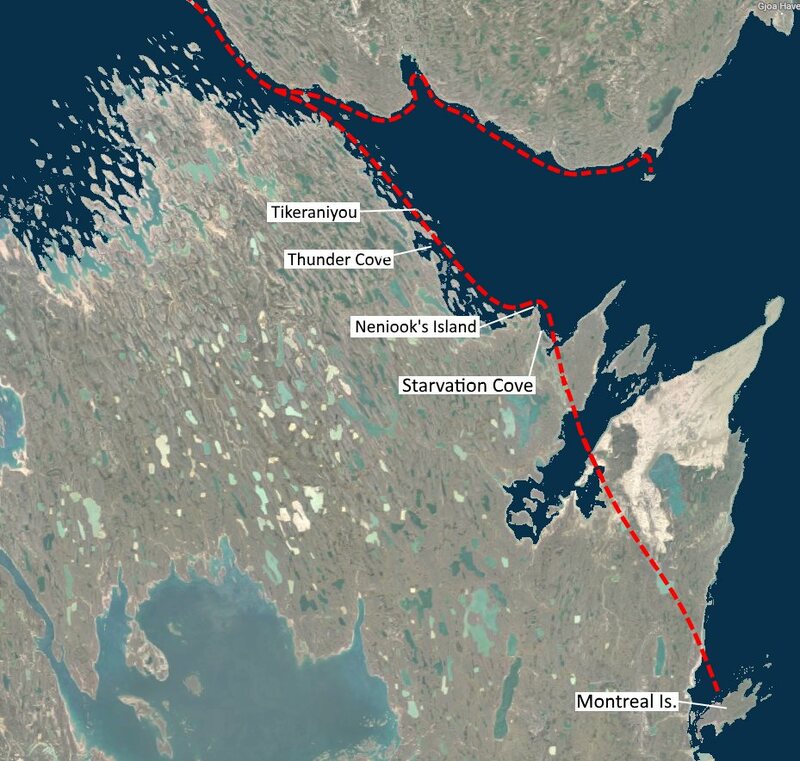 The viability of this route is underlined by its similarity to the track which Lt. Schwatka took on his return journey to Hudson's Bay in 1880. Learmonth's map mislabels Starvation Cove as west of the next point west of Richardson Point, when it was actually at the base of Richardson Pt, according to modern maps. He then put Neniook's island (2) east of his location for 'Starvation Cove', when it was west of it, as you have indicated on the satellite map showing the theoretical route. From Learmonth's description, he found bones where you have indicated Neniook's Island, although you do not say how you decided where that island was. Tikeraniyou (1)is likely not the one far to the north west, (shown in a sat. photo)as that Tikeraniuyou is an island and Learmonth said the bent finger was a peninsula, where the land turns to the south west. There is a bent finger shaped peninsula just south of where you have indicated Neniook's island, where the land turns to the southwest, or at least it probably was a peninsula before the sea floor rose. Her find and Learmonth's may have been very close to each other. All this is just a detail. The thesis of your post still stands. For Crozier to go the same track as Schwatka, using sleds, the ground conditions would have to be similar in 1848 and 1879. Did Schwatka describe the conditions near Montreal Island ? In the 27 years since Unravelling was published this is the first time I have seen this contrary evidence indicating an alternative route publicly noticed - thanks! this sort of makes sense. i've been researching for my novel and believe all of their activities and the tragic amount of remains found along the SW shoreline of KWI was evidence of the fact that a break up of the sea ice marooned crozier and his men in the precisely the same way that george back and his men were barred from crossing the simpson strait during his 33/35 expedition. they probably saw that all the sea to the east of sir john ross point was insurmountable. i'm thinking eventually one, possibly two of crozier's boats pushed off from the beach at douglas bay and ultimately ended up at starvation cove. also, like captain back, they would have had to battle with loose ice. i've been looking at various geological maps, and can draw an almost straight line from starvation cove, squirrel river and the valley behind macrary isthmus - all the way to the river/s that connects lake franklin and, interestingly, back to the sherman basin. the max this starvation cove route rises to is around 95 feet over a distance of 40-50 miles. far easier than the chantrey inlet if it is choked with ice, no? ...also, i have another theory. given the position of erebus at W&C bay, a second party bent their way clear through the sherman and inlet basin and proceeded to meet the first party at lake franklin - from there, the two parties would meet and then proceed together along the back's river.